Early summer is the perfect time of year for roadtrips… It's not quite the holidays, but come Friday, all you want to do is escape for a weekend at the Coast. Cruise up the highway to eat, drink and escape. Grab a cup of coffee from Noosa locals Flying West Small Batch Roasters. Don't leave without a guilt-free raw treat to kick start the day. If you want to save your pennies for the shopping spree (see below) then Global Café's affordable breakfast will have you laughing all the way to the bank! We're sold. A cute little retro American Airstream van for a Segafredo coffee on the go. Local coffee roasters. Try a cup of the Cooloola Cool—you'll be buzzing after this one. Bistro C is a given for any Noosa trip. Smack-bang in the middle of Main Beach, it's an excellent choice any time of day. Particularly if that choice involves breakfast mimosas. A funky and eclectic hang out that's prefect for a laidback and leisurely afternoon session. Order the more-ish mezze platters to keep your stomach at bay. Stop in here to make any Noosa weekend a winner. Crammed full of fresh, and locally sourced ingredients, everything here is made on site each day. We love good fish and chips here at TUL and we have it on good advice that you can't go past this spot in Noosaville for the BEST calamari! Because sometimes you just need to feed a dumpling craving. Head here for Yum Cha on a Sunday. If you've indulged in too many cocktails and the bank balance is suffering… A mean chicken parmy at the right price! An oldie but a goldie. Sometimes a casual pub meal with the best views in Australia just hits the spot. Ocean-front perfection. THE spot for a post-beach bubbly, while watching twilight settle. Ease into the evening with a spiced honey mule. You're welcome. Scrumptious antipasti, pizza and pasta made with fresh, locally sourced and certified organic products. Yum! A dining must-do when in Noosa. The freshly shucked Coffin Bay oysters with lemongrass sorbet are to-die-for! And the deep-fried olives are oh-so-amazing. Hunt down this hidden gem in Noosaville for fine dining with creative flair. Inventive vegetarian dishes like sweet potato purée with oven baked mushrooms, green beans and lemon mustard. The Australian calls it the best Japanese in Australia. Hard to argue with that! Sitting pretty on the stunning Noosa River, it's on the money for an impressive and unforgettable date night. Treat your tastebuds to some molecular gastronomy. Made fresh to order, with dry ice involved, this insanely smooth ice cream is entertaining and delicious all at the same time. The salted caramel popcorn is so good! Trust. Us. No matter what beach-ready diet you're on, commit to working your way through of every flavour of velvety gelato at this institution. Blueberry yoghurt, tiramisu and meringua are our top picks! Head back to the French Quarter for dessert menu to-die-for. We recommend the Valrhona chocolate and honey tart with salted caramel and stracciatella gelato. Yum! Stocked full of independent and local labels—as well as covetable international imports—they've been dressing the Sunshine Coast's sartorially savvy for years. If the likes of Acne, Paul & Joe Sister and Paschbeck take your fancy, head for some high-end retail therapy in the French Quarter. Pick up some lust-worthy homewares in the heart of Noosa's main strip. Grab some of the Sunshine Coast's best bread, local cheeses and olives for your National Park picnic. A hike with cheese involved is totally worth it! We love a good market, and Sunday mornings at Noosa Farmers Market ticks all the boxes: fresh, local produce, and some delicious breakfast options! Indulge in a pampering massage or beauty treatment to melt all those city worries away. And there's no need to get out of bed to enjoy this indulgence, they'll come to you! We highly recommend the Kahuna Massage. When you have a car as sleek and sporty as the Giulietta, it will be tempting to spend most of your time just cruising. 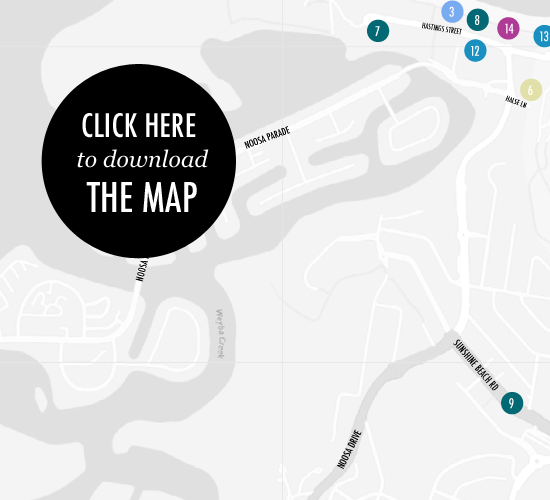 Here are some great locations just outside of Noosa to make the most of the pimpin' ride! Make the short 20-minute drive down the coast to Perigian Beach for a rustic lunch with soul. Take a drive through the rolling hinterland hills for a taste of the French provinces. The pastries and macarons are out of this world! Learn the tricks of the Thai cooking trade in a lush tropical forest in Yandina. Or let one of the professionals whip you up a delish Thai Beef Carpaccio! Continue the Asian cooking school theme at another hinterland gem. They'll have you whipping up dinner party feasts in no time! Stand Up Paddle Surfing is a great way to get a taste for surfing without all the pressure of actually catching waves (it's a hard hobby to master—trust us, we've tried!). Hire a board and get one of the friendly instructors to show you the ropes. Adventure through the Noosa National Park with a packed picnic and stop off at the secluded beaches tucked in to the headland. Start the day off with an adventurous walk through the National Park to wake you up and blow any stress right off your chest! TUL Note: Today's List Love post is proudly sponsored by Leo Muller Group and endorsed by The Urban List. The Alfa Romeo Giulietta is the perfect car for roadtrips; With nimble handling and a streamlined body accentuated by sporty elegance, the Giulietta was built for the busy Euro streets and exudes world-class style from every angle. Contact the friendly team at Leo Muller Group today to get your hands on one for a test drive. Our sponsored posts will never be a secret - the List Love seal will be stamped on any sponsored material you see on the site. Thank you for supporting the sponsors who make The Urban List possible.